Are radical policies the answer to Labour’s slump? Posted in Labour, Politics, Polling Matters on April 24th, 2017 by Leo – Comments Off on Are radical policies the answer to Labour’s slump? This was originally published on Political Betting. Despite using Easter to announce several policies, Labour is making little effort to pretend it knows what it would do with power. The party’s website still invites visitors to “help shape our next manifesto” and Corbyn semi-loyalist Dawn Butler suggested on Newsnight there might have to be a “rolling manifesto” while policies are developed. This isn’t just a lack of detailed policies. It’s also about what Labour stands for and who it is trying to appeal to. Corbyn ran for the leadership with the promise of a “radical economic strategy” yet the recent announcements have largely been repeats of earlier Labour policies. Free meals in primary schools was floated for the 2010 election. A plan to pressure big companies to pay suppliers on time was in the 2015 manifesto. The triple lock on pensions was another Miliband pledge. You could argue that Labour’s recent policies go further than previous ones. But no-one can seriously claim they would revolutionise the economy. As such, they seem designed for the same voters – progressive but not radical – that the 2015 manifesto aimed to win over. Yet Corbyn’s Labour has also made some radical pledges that wouldn’t have made it into recent manifestos. Among its current 10 pledges are rent controls and nationalisation of the railways. This week’s Opinium poll for the PB/Polling Matters podcast tested public views of eight possible and actual Labour policies. The policies that did best were a mix of the radical and the incremental. Two of the top-scoring were 2015-style measures: a £10 minimum wage in 2020 (more radical than Miliband, but hardly socialist) and requiring companies to pay suppliers on time. Also among the top-scoring was “control rents so landlords cannot keep increasing the amount they charge”, which 47% of those considering Labour strongly supported. Surprisingly, that measure was most popular among the 55+ age group, and least popular among the ‘generation rent’ 18-34s. Other radical policies were much less popular though. 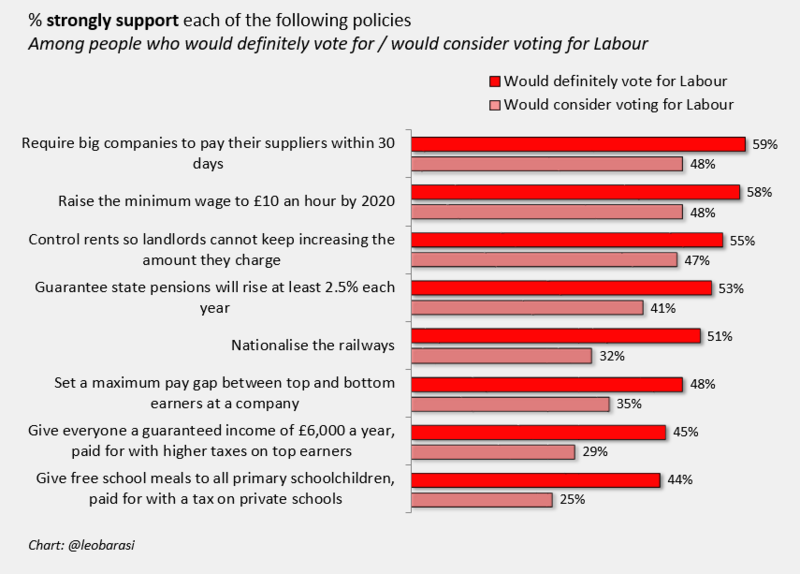 A citizens’ income of £6000 and railway nationalisation were strongly supported by only 29% and 32%, respectively, of people who would consider Labour. So Labour might find support for a mix of tangible incremental policies, and radical policies aimed at tackling a well-known problem. With 49% saying they would at least consider Labour, these policies appear to win the strong support of around a quarter of the population – suggesting there is still a 25% strategy open to Labour. But while this might suggest Labour could avoid slipping further, there are two problems with this approach. First, such an incoherent mix of policies would leave voters struggling to know what Labour stands for. One set of policies suggests Labour would govern as social democrats. The second set suggests Labour wants to revolutionise major parts of the economy. Without a unifying argument, Labour’s pledges would be easily forgotten. Ed Miliband didn’t lack popular policies but the failure to stake out a clear position, and stick to it, cost the party at the election. Second, the poll also suggests even well-scoring policies may be less popular than they seem. Over Easter, Labour’s policy that got the most coverage was the pledge for free school meals. Yet this was the least popular of the policies tested. It’s hard to be sure why it did so badly, but free food for children doesn’t seem an inherently unpopular measure. Its failure in the poll might be because it is now associated with Labour. If that’s the case, more policy announcements might do little to stop Labour’s vote sliding further, even if they were popular before they become linked with the party. This article was originally published on Political Betting. The SNP lost a referendum and won a landslide. Could the Lib Dems do something similar by becoming the party of Remain voters? This week’s PB/Polling Matters Opinium poll suggests the party could do well with a relentless focus on stopping Brexit. But it also shows that a single-issue stop Brexit party would be unlikely to win more than a quarter of voters. Only around 11% currently say they’d vote Lib Dem, but the Opinium poll found 41% of the public would definitely vote Lib Dem or would consider doing so, including 47% of current Labour voters. Winning over half of those considering the Lib Dems would put the party above even its record 2010 vote. So should the party try to gain these voters with a promise that they would keep the UK in the EU? In part the poll backs this up. Among those who voted Remain, 60% would at least consider the Lib Dems – around 29% of voters. But this overstates the opportunities for the Lib Dems in focusing on stopping Brexit. Most Remainers don’t care enough about staying in the EU to put it above all other issues. In another question the poll found that only 22% agree with the statement “My top priority when deciding who to vote for is supporting a party that will try to stop Brexit”. This 22% may be a more realistic limit for how far a stop Brexit party could go. This still suggests the Lib Dems could double their vote share with an anti-Brexit focus. Even winning over just those who strongly agree with the statement, and aren’t already Lib Dem voters, would add 7pts to the Lib Dem vote. With Labour now facilitating Brexit, the field is clear for the Lib Dems to be the party of Remain. The poll suggests this focus could serve the Lib Dems well, in comparison with their 2015 vote. But a single-issue stop Brexit party is unlikely to win more than one in four voters. Unless the UK’s exit goes so badly that public opinion changes, this focus can take a party from fourth to third, but it can’t take them from third to second.